We offer laminate oak flooring in many colours and decors. Natural oak laminate flooring is available in light colours like white, light grey and light brown and in dark colours like dark brown and black. 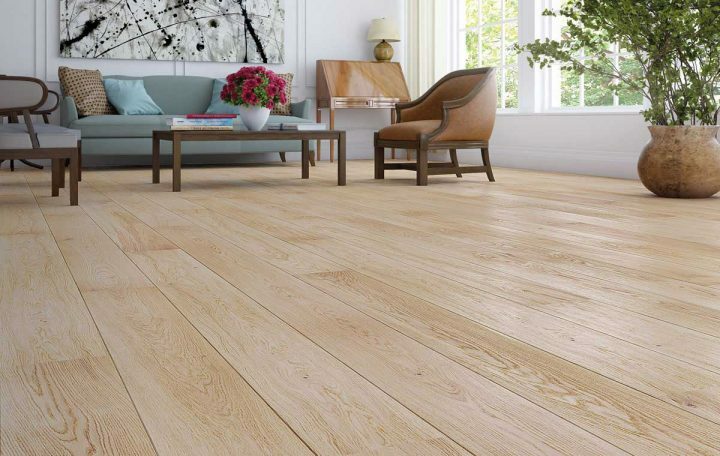 Light coloured natural oak laminate click flooring is usually installed in small spaces with insufficient lighting. Light floors enlarge rooms and give them elegant look. If you want to create beautiful contrasts in rooms, combine light flooring with dark furniture and dark coloured walls. If you want to create serene and calming feel, you should harmonize your light floors with light coloured furniture and light walls. 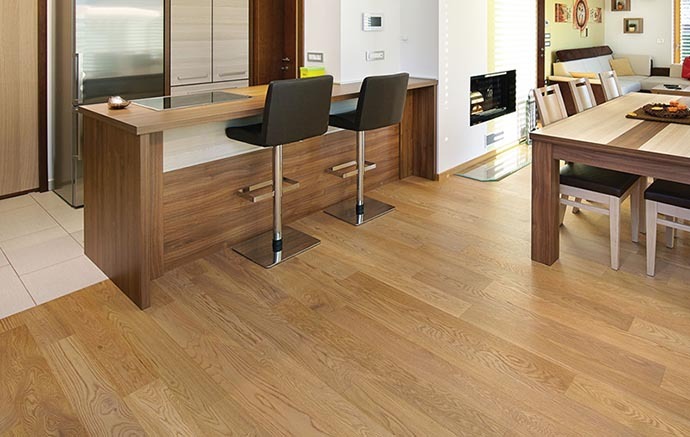 On the other hand, dark natural oak laminate looks best in big spacious rooms which have plenty of lighting. Rooms with dark natural oak laminate have very traditional impressive look. To create contrast we advise to combine dark natural oak floors with light furniture and light walls. Medium oak laminate flooring is most popular among our clients. Medium brown or medium grey colour are both very universal and can be combined with almost all other colours. Medium brown natural oak laminate is a classic choice because it looks like hardwood. Technology that is used in production of laminate makes it possible to create exact copy of hardwood décor and apply it to laminate tiles. Medium natural oak laminate is great if you want to achive traditional or contemporary feel of your home. Medium grey colour of natural oak laminate flooring is becoming very popular because it is best for creating industrial look. Grey neutral colour harmonizes well with materials like stainless steel, glass, natural stone. Grey colour can be combined with every other colour so it gives limitless options with decorating. Oak engineered laminate flooring has an appearance of hardwood flooring but it has many advantages. It is budget friendlier than hardwood so it is usually completely replaced more often. Installation of hardwood requires use of glue which has toxic fumes and it need to dry for couple of days before you can use the floors. Natural oak laminate flooring is installed with floating method without use of glue and floors can be used immediately after installation. Because there are no toxic fumes, this installation is health and environment friendly. There is no sanding or lacquering after tiles are laid, so almost no mess from installation is left behind. Natural oak laminate flooring offers many colour and décor choices.